I love working on canvas with paint, texture medium and pearlized accents. There is something therapeutic about working with texture medium and paint. When you start out playing it just evolves with each brush stroke. I printed the picture of the ladies creating on muslin and then stitched around them and added the words printed on vintage journal paper. 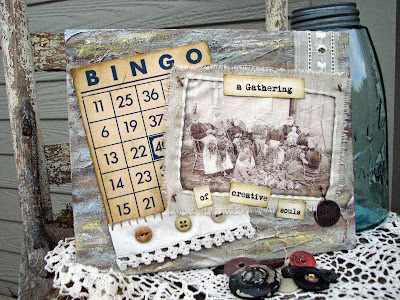 I also added bit of vintage lace, buttons and a bingo card. Okay...I'm gonna need you to teach me how to do that please! Or, better yet, maybe you could just create one for me, too:) Your canvas art is really wonderful! so creative and beautiful, I love it! you use the perfect pictures! Love it, and love the old chair you have it set up on. Hi Sheila! I came over because I wanted to personally invite you to the blog party I am throwing. 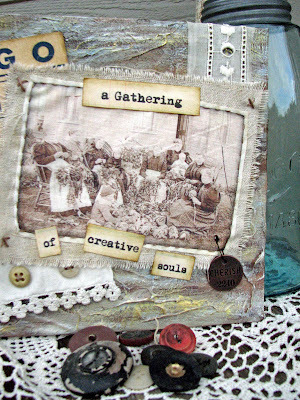 I think it will be fabulous, and I want all my fabulously creative friends to come! It's called...Where Bloggers Create! I would love for you to show off your workspace! Hop over to My Desert Cottage and read all about it! It is so beautiful! Love every single detail...you are so talented!